We may never see iMessage on Android. 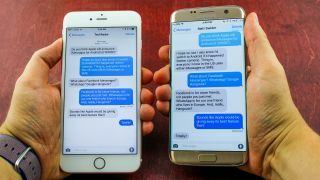 One of the big rumours going into WWDC 2016 was that Apple might open up iMessage and produce an Android app for it - that didn't happen, although the iOS and macOS Messages apps did get a host of minor tweaks and upgrades. Now an Apple executive has revealed the reasons why iMessage remains exclusive to the company's devices - and it sounds like you shouldn't be holding your breath for the software to make the leap to other platforms anytime soon. It's actually no surprise: the unnamed executive told Walt Mossberg at The Verge that keeping iMessage locked to Apple's hardware helps shift more iPhones, iPads and Macs. Porting it to Android would mean one less reason to buy an iPhone 7. The source also said that with over a billion active devices to work with, there's plenty of data to dig into to improve the AI underpinning Apple's messaging services. There's no need for Apple to try and expand the number of users beyond that right now. All of which makes sense for Apple, of course, but it pushes people with iPhones who want to chat to friends on Android (or vice versa) towards alternative, cross-platform solutions like WhatsApp, Facebook Messenger or even Google Hangouts. All of those apps work in a web browser too. Still, it doesn't seem to have done Apple much harm so far, so the company won't be changing its mind for a long while. If you really want to run some Apple software on your Android device, you're stuck with Apple Music for the time being.